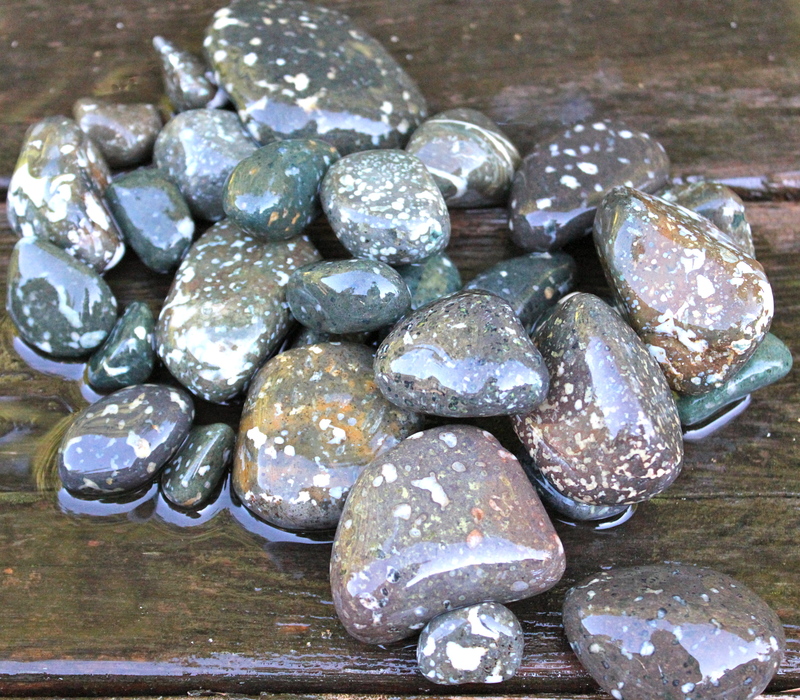 Here’s a collection of all the rocks that have survived coarse grit in my rotary rock tumblers and are now ready to go in the vibe. 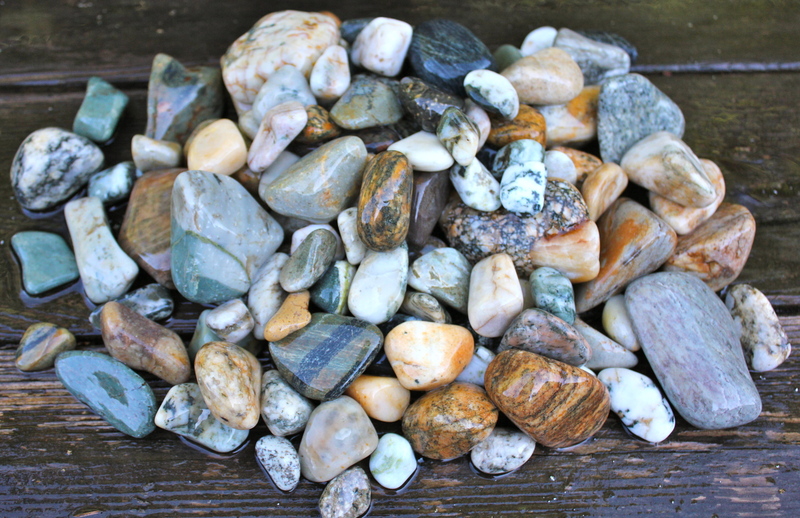 They’re split up into groups of Dallasite, quartz, speckled opal, greenstone (some of it jasper), a few porphyries and Flowerstone, and a pile of river rock/gneiss/quartz/petrified wood. 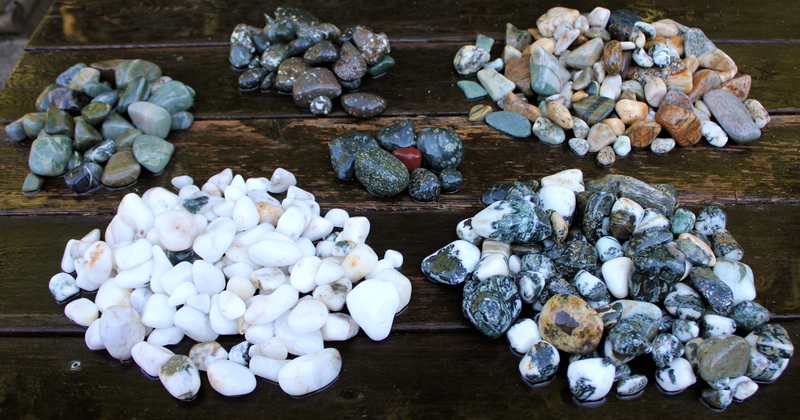 Clockwise from top left: greenstone (some jasper, believe some serpentine and other), speckled common opal in basalt, gneiss/quartz/river rock/petrified wood, Dallasite, quartz. Middle: Flowerstone, other porphyries and single piece of red jasper. All from British Columbia, Canada! I was lenient with a few pieces and you might notice some pits and cracks. I find that the next phase in the vibratory rock tumbler can smooth out some of the problems that come up in coarse grit. 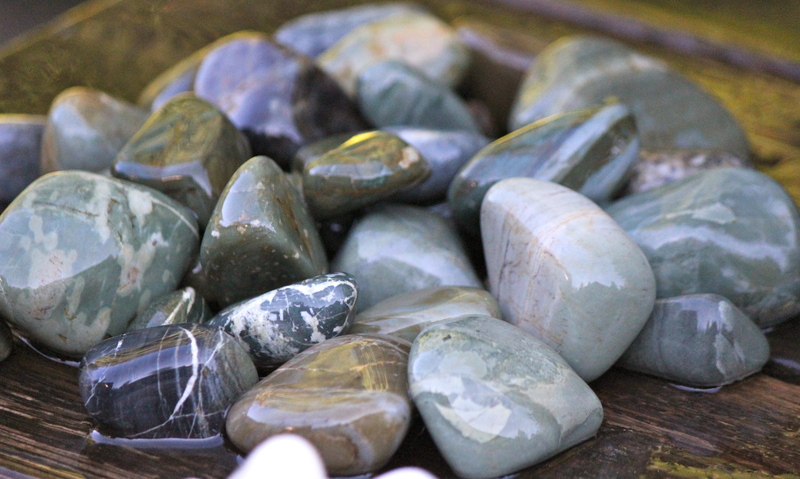 Greenstone, some jasper. I’m still figuring out how exactly to classify and sort this stuff. It’s not all the same. Rocks with larger holes and undercutting have to go back to coarse grit and grind down a fair way more. There are a lot of rocks I’ve had to throw back to phase one, and many of the rocks you see here have had more than one trip through coarse grit. Speckled common opal in basalt. 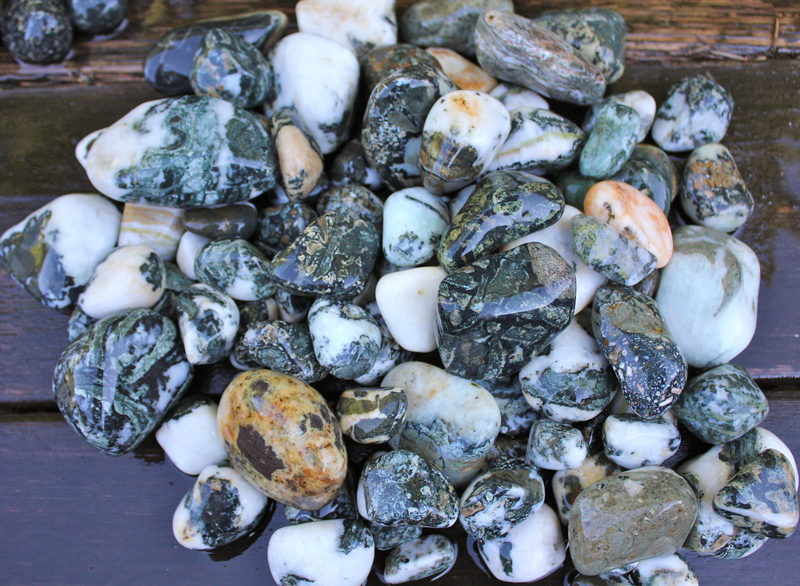 With rocks made up of materials with different hardness levels like Dallasite (a jasper breccia of quartz, epidote, basalt and pumpelleyite) undercutting is impossible to avoid for every rock. Gneiss, quartz, river rock, petrified wood, and generally a misc pile of river finds. 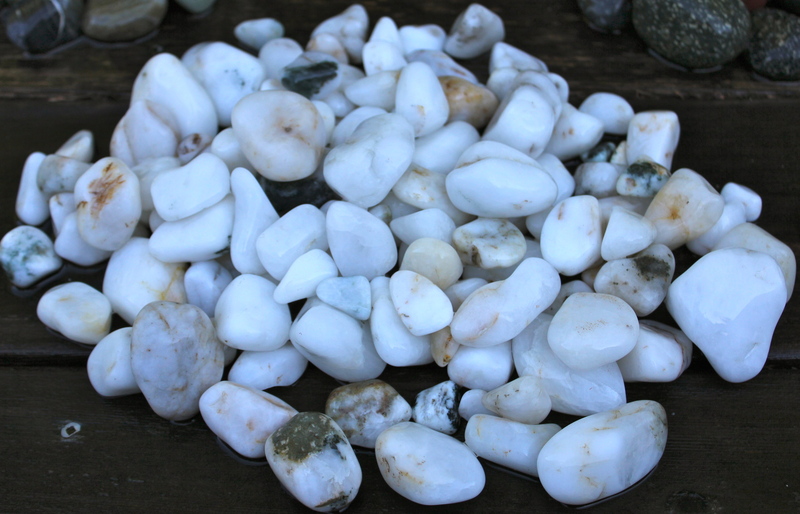 I’m an obsessive person and want the smoothest-possible rocks in the end, but it’s clear from my own experience and seeing the tumbled stones sold in stores, cuts and pits are unavoidable. Dallasite, a jasper breccia from Vancouver Island. My favourite and the signature of the island. Unfortunately my local rock and gem store was closed yesterday so I couldn’t get ceramic media and finish my other Dallasite in the polishing phase. I need media to cushion the stones and fill the bowl up more to get the best tumbling action. Just some river quartz. I like it, but it’s very common. The inclusions and colouring can be interesting. Soon, soon. I am truly in need of a warehouse and operations headquarters. And another rock tumbler or two! Thanks for looking.